When developing a hard-floor maintenance program, there will inevitably be a question about which chemicals to use. As with frequencies, however, there is no easy, blanket answer. Even if a flooring installer or your distributor’s salesperson recommends a particular chemical, McNealy suggests verifying that information with the flooring manufacturer. To find flooring manufacturers’ cleaning recommendations, managers can look inside the box of materials for a maintenance guide. If the original flooring packaging cannot be accessed, visit the manufacturer’s website or call their technical department. If managers don’t know who made the floors, hire a floor inspector to identify the manufacturer. Inspectors are available through the Institute of Inspection Cleaning and Restoration Certification (IICRC) or the National Institute for Certified Floorcovering Inspectors. If all else fails, and the floor’s origin cannot be determined, experts agree it’s best to use neutral cleaning agents. Using an acidic (low pH) cleaner on travertine, marble, limestone, or terrazzo can etch and ruin the tile and grout, as well as wear away any sealer on the floor. “Some workers have accidentally removed grout entirely by attempting to use an acid cleaner for maintenance and to remove stains,” says Harris. At the other end of the pH scale, alkaline cleaners can also have damaging effects. They can penetrate natural stone tiles and cause the floor to pockmark, for example, or remove finish from linoleum or VCT floors. Using the wrong products isn’t the only mistake janitorial crews can make when it comes to chemicals. To eliminate this potential problem, McNealy recommends single-use cleaning chemicals, rather than dispensing systems. 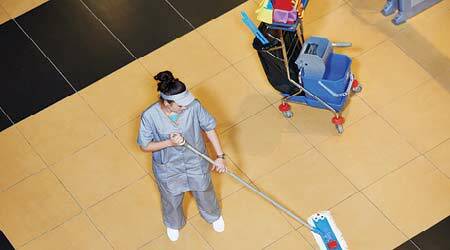 Facility cleaning managers should be mindful of additional potential hazards when creating hard-floor maintenance programs. For example, heat can cause serious problems. Steam technology is becoming more popular but, if used incorrectly, it can damage almost every type of hard floor and void warranties. The same goes for burnishing at too high a speed, which can create heat that could damage resilient and rubber floors. LVT floors are also thermally sensitive, meaning even direct sunlight can lead to warping. Managers in states with colder winters should be mindful of ice melt being tracked in onto hard floors. Not only can its slippery residue create a slip-and-fall hazard, ice melt can also damage floors if not properly cleaned up. It should be swept up frequently and, when the weather improves, the floors should be thoroughly cleaned to remove any residue. There are many factors to consider when creating a floor maintenance program, but managers don’t have to do it alone. Jan/san distributors are a great source for recommendations of products and proper cleaning procedures. Most will also provide staff with appropriate training of best practices.